This is a beautiful "Antonov" daughter!! Our puppies are sold as companions on a limited registration and spay/neuter contract. We have a high demand for our puppies therefore a non-refundable deposit of $1000 is required once the puppies are born. This deposit is applied to the price of your puppy. We can not hold a puppy with out a deposit. Deposit may be by check, cash, money order. We accept credit cards by Pay Pal, also. Unfortunately we are no longer taking personal checks as final payment. There are new USDA regualtions regarding placement of puppies. You may have an agent see your puppy before we send your puppy to you. We will meet you half way. SHOW/BREEDING POTEINTIAL PUPPIES ARE STILL ALLOWED TO BE SHIPPED. At this time, if we violate this rule... by shipping "ONE puppy SIGHT UN SEEN by purchaser or his/her agent"... we will have to be licensed as a commercial breeder. This would mean that our dogs and puppies would have to be kept in a separate building from our home. 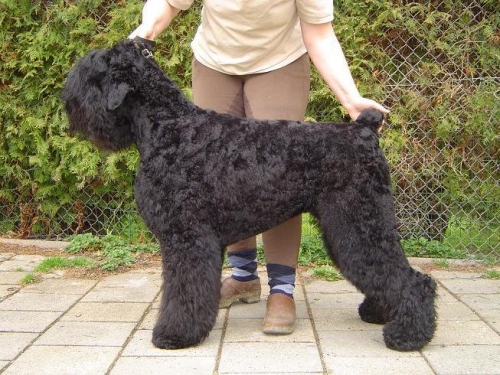 (otherwise our home would have to have floor drains in the floor.. commercial flooring.. and wall coverings.... so they can be hosed down and sanitized as in a kennel) I'm sorry but that is not the way I want to raise my precious Black Russian Terrier puppies. I have spent decades developing the temperament of my dogs and their puppies...Our dogs are family members....They thrive on human contact.I do not agree that this for the welfare of my dogs. That being said... We will abide by the rules.... to be able maintain a "home" environment for our dogs and our puppies.